Instagram, once a social network dedicated purely to posting pictures of food, has become prone to feature creep (not unlike Facebook's other properties). Back in August Instagram added Snapchat-like stories, and earlier this month Boomerang support. 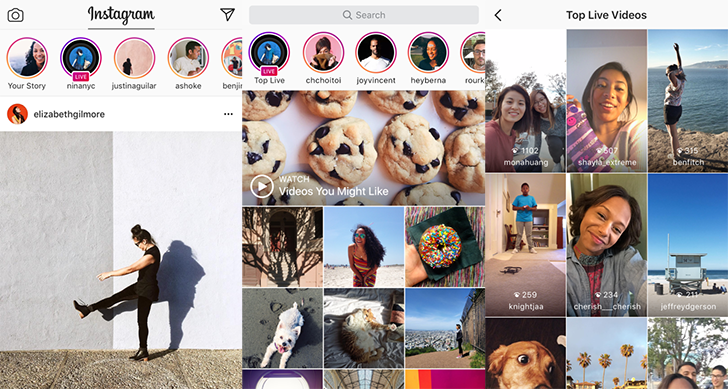 Today the company announced two new features for the app - Live video on Instagram stories, and disappearing photos/videos in direct messages. The live video feature is almost a direct clone of Periscope, complete with sending hearts to the broadcaster by tapping the screen. Once available (it is still rolling out), Live video shows up as a new option on the camera screen. Friends "may" receive a notification when you go live, and your story icon at the top of the main feed will have a 'Live' badge. The comments appear above the broadcast, but users can pin a certain comment or disable them entirely. The second new feature is the ability to send disappearing photos and videos in direct messages, which can only be viewed once. If you've ever used Snapchat, this should sound pretty familiar. You will receive a notification if the recipient reopened a message, or took a screenshot. Just like live video, this feature is still rolling out to users. You can grab the latest update from the Play Store link below, or from APKMirror. I'm now taking bets on what app Instagram will clone next.